Though today's recipe is not the most extravagant I have ever posted, it may very well be the most important. It's the recipe that would eventually lead to me starting The Kitchen Wife. The recipe that changed everything, Sausage Gravy. Let me set the stage for you. It's May in the year 2000, and I've been married approximately 48 hours. It's the first morning of our honeymoon in a cabin located deep in the mountains of West Virginia. 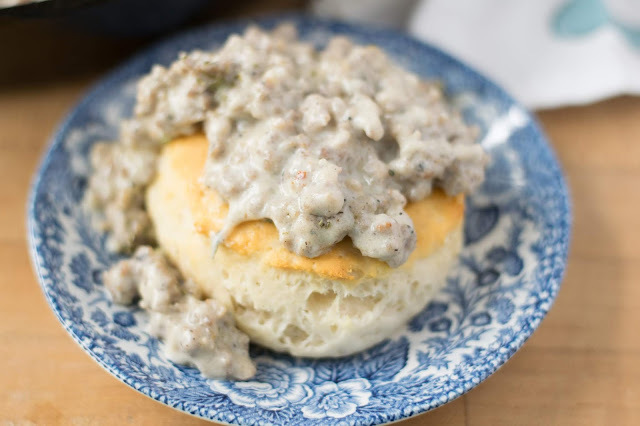 My brand new husband has asked me to make his very favorite breakfast for him, sausage gravy and biscuits. Long story short, it was a disaster and I was so embarrassed. This is when I realized that coming from a family of great cooks doesn't mean you can cook, and it was in this moment I decided that I would spend a lifetime learning how to cook. This way I would never have to experience this humiliation again. So here we are, 18 years later, and I'm making this recipe for you on my RECIPE BLOG (what!?! ), where I teach people how to make the food we love, in a way that anyone can be successful at! To begin you will need to place your pan over medium/high heat and allow it to get hot. Next you will need to cook your sausage until it is brown and no longer pink. To the fat in the pan add the flour. If you find that your pan is "dry", you may want to add 2 Tbsp of butter. Whisk the flour into the fat and let it cook for about a minute. Pour the whole milk into the pan while whisking vigorously. You want to make sure to get all of the lumps out because no one wants a lumpy gravy. When making gravy I DO think it's important to use whole milk. Though you can use 2% or skim, the whole milk lends itself to a thicker, creamier gravy. Let the gravy gently simmer while it thickens, continually whisking. Once your gravy is at the point you like it (some like thicker gravy, some like thinner) return the sausage to the pan. 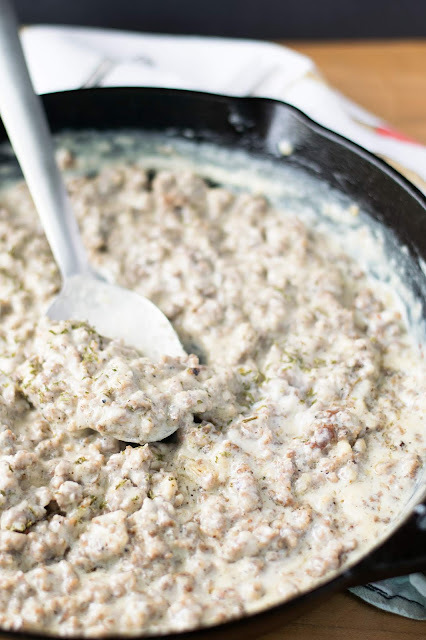 Mix everything together and your Sausage Gravy is ready to go! Look at how thick and creamy that gravy is! It has just the right amount of kick from the pepper as well. 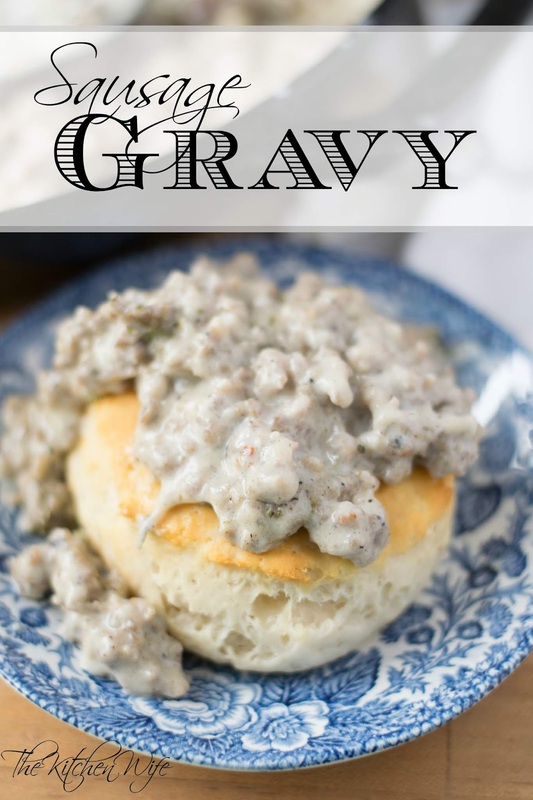 Of course no respecting West Virginian would have Sausage Gravy without scooping it over a nice, flaky, Homemade Biscuit! Now THAT is a plate that my little small town girl's dreams are made of! It's certainly an improvement from the watery mess that was 18 years ago! We love this meal for breakfast or dinner and I know you will too so get in the kitchen and make it tonight! Place a pan over medium/high heat and allow to get hot. Cook the sausage until it is brown and no longer pink. If you find that your pan is dry, add 2 Tbsp of butter. Add the flour to the pan, whisking it into the fat. Let cook for 1 minute. Pour in the milk while whisking vigorously. Make sure to whisk out any little clumps of flour. Let simmer, while whisking, to allow the gravy to thicken. Once the gravy has reached your desired thickness, return the sausage to the pan and add the salt and pepper. Mixing everything together and scoop over biscuits.